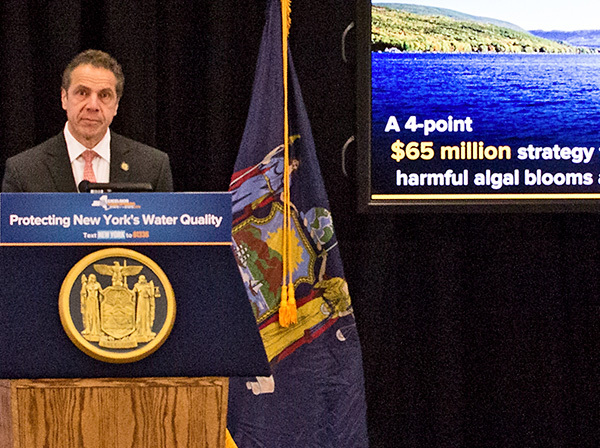 Governor Andrew M. Cuomo visited the ESF campus today (Dec. 21, 2018) to announce a $65 million, 4-point initiative to aggressively combat harmful algal blooms in Upstate New York. The following is an announcement from the Governor's office. Governor Andrew M. Cuomo today unveiled the 12th proposal of the 2018 State of the State: implementing a $65 million 4-point initiative to aggressively combat harmful algal blooms in Upstate New York that threaten the recreational use of lakes that are important to upstate tourism, as well as sources of drinking water. The State's Water Quality Rapid Response Team, co-chaired by DEC Commissioner Basil Seggos and DOH Commissioner Howard Zucker, will convene four Regional Summits to bring together nation-leading experts with Steering Committees of local stakeholders established for each lake. The Rapid Response Team, national experts, and local stakeholders will collaboratively develop Action Plans to identify contributing factors fueling HABs and the state will provide $500,000 per lake to develop immediate action plans to reduce sources of pollution that spark algal blooms. The state will provide nearly $60 million in grant funding to implement the Action Plans, including new monitoring and treatment technologies. "Protecting water quality is a top priority and through these actions and funding, we are providing direct assistance to communities to ensure their water resources remain clean," Governor Cuomo said. "This comprehensive program will continue New York's national leadership in responding to the threat of harmful algal blooms and implement new and innovative strategies to safeguard our clean water for future generations." This initiative will bring together leading researchers from across the nation, including experts from Michigan, North Carolina, Ohio and Vermont, as well as the SUNY College of Environmental Science and Forestry, SUNY Stony Brook Center for Clean Water Technology, the New York State Soil and Water Conservation Committee to share best practices and develop innovative solutions that can be replicated in water bodies across the state. The announcement builds on the State's $2.5 billion Clean Water Infrastructure Act investments in clean water infrastructure and water quality protection. Through Governor Cuomo's leadership, New York has developed the most comprehensive HABs outreach and monitoring programs in the country, led by DEC sampling ambient waters across the state and Department of Health sampling at regulated beaches and public water systems. In recent years, the extent, duration, and impacts of HABs have increased. HABs occurrence has been linked to phosphorus and other nutrient inputs and is exacerbated by heavy rain events and warming waters related to climate change. In 2015, DOH documented an estimated 35 HAB-associated illness cases in 16 New York counties, all associated with exposure during recreational activities like swimming and boating. In 2016, drinking water for more than 40,000 people in Cayuga County was impacted when HABs-related toxins were detected in finished drinking water for the first time. Last year, Governor Cuomo invested more than $2 million to construct state-of-the-art water treatment systems in the city of Auburn and town of Owasco to remove algal toxins from drinking water supplies, and established the Finger Lakes Water Hub to study algal blooms, work with local agencies and researchers, and undertake pollution reduction projects. Additionally, the State granted over $700,000 and expedited permits to Cayuga County for its Owasco Flats Wetlands Restoration initiative, designed to prevent nutrients from flowing into Owasco Lake, thereby discouraging the growth of algal blooms. In 2017, more than 100 beaches were closed for at least part of the summer due to HABs, and Skaneateles Lake, the source of unfiltered drinking water for several communities including the city of Syracuse, was threatened by algal blooms for the first time. While the finished drinking water was not impacted, this event highlights the need to better understand the causes and control of these HABs. DEC Commissioner Basil Seggos said, "Through Governor Cuomo's leadership, DEC expert staff continue to actively investigate the causes of algal blooms and pioneer new and innovative solutions to address the challenge these blooms pose across the state. With the launch of this new initiative and funding, DEC will work together with our state agency partners, nationally recognized experts and local municipalities to prioritize actions on necessary projects that will ensure clean water for all New Yorkers." New York State Health Commissioner Dr. Howard Zucker said, "Protecting public health for New Yorkers who use our water bodies for both recreation and drinking water has been a priority of Governor Cuomo's administration. Bringing together the best and brightest experts to help develop specific strategies to reduce the risks of harmful algal blooms builds on the state's important commitment to providing clean water." Senator David J. Valesky said, "To reduce the negative impacts harmful algal blooms have on New York waterbodies, it is critical to study what is causing them and how we can control and limit this threat. We must also work together and learn from the communities facing this growing threat. With Governor Cuomo's leadership, New York has more than stepped up to the challenge, pouring significant funds into research and outreach in an effort to ensure clean and safe water for all New Yorkers." Senator Betty Little said, "Governor Cuomo's inter-agency Drinking Water Rapid Response Team will work to learn from our communities and help to develop action plans that will address HABs in waterbodies across the state. This will help speed up critical projects to reduce the pollution that sparks blooms - a vital step in bolstering tourism, preserving the state's water supply while protecting the health and wellbeing of residents in the North Country and beyond. Today's announcement puts New York at the forefront of national efforts to address the growing challenge of harmful algal blooms." Assemblymember William B. Magnarelli said, "Governor Cuomo continues to show that protecting the environment is a top priority in New York State. Under his leadership, the state continues to make significant investments to investigate the cause, nature, and extent of harmful algal blooms in an effort to identify solutions to address the challenges presented by them. These efforts will go a long way in safeguarding the health of our communities." Onondaga County Executive Joanie Mahoney said, "With Governor Cuomo's proposal and this groundbreaking collaboration of state and national leaders, we are one step closer to understanding this emerging threat of harmful algal blooms. New York's first-ever HABs summits will bring together internationally recognized researchers, government officials, and scientists, and environmental organizations to devise future strategies for attacking HABs in Onondaga County and beyond. Working with the Governor and communities threatened by these blooms, we will develop solutions to meet this challenge."